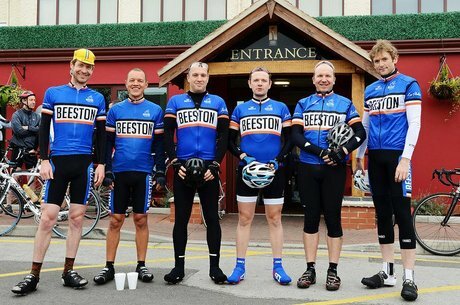 Beeston Cycling Club is a friendly cycling club based in Beeston, Nottinghamshire. 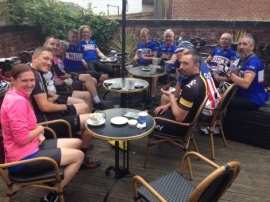 We offer a wide range of cycling and social activities with rides taking place most days of the week. The club was formed in 2009 by a group of cyclists following the successful Beeston to Paris bike ride to raise money for Round Hill Primary School. Some members had looked around at other clubs and found they couldn’t fit in with group rides at set times and so started arranging to ride together via a ‘blog’. Many of the current club members are parents with small children and so the only time they have is to ride in the early morning. Other members with different needs have started arranging evening rides, or weekday rides. The ethos of the club is firmly based on giving members support to arrange what suits them. The club comes together with social events and bigger rides every couple of months. We have one major ‘Sportive’ every year. All ideas for events are welcome. 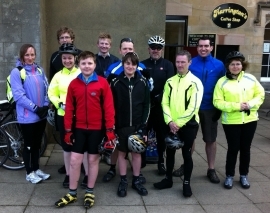 We welcome family membership and ask that children (Under 16s) come on club rides with parents or carers. We are working on family cycling days and how to involve children in cycling as a sport. Leaving a message on the forum will find you a riding partner or an answer to most questions on training, repairing your bike or buying kit. Give us a try! Some of the original members on an early training ride. The obligatory café stop after a Social ride. A regular social ride to Elvaston Castle.